Cycling holidays come in various guises. Below we explain the types of holiday we offer. Trail cycling is a great alternative to traditional mountain biking. Like road cycling it rarely requires the rider to possess any technical skill beyond the ability to simply ride a bike. However, like mountain biking the terrain is often much more interesting and varied and most importantly the routes are largely traffic free. In essence it is mountain biking but much less demanding and it affords participants the opportunity to brush shoulders with nature in a way that simply isn’t possible for road cyclists. For some mountain biking is riding the purpose built trails of Glentress Forest just outside Peebles in the Scottish Borders. While for others it’s cycling along an old drovers track in a remote part of the Scottish Highlands. 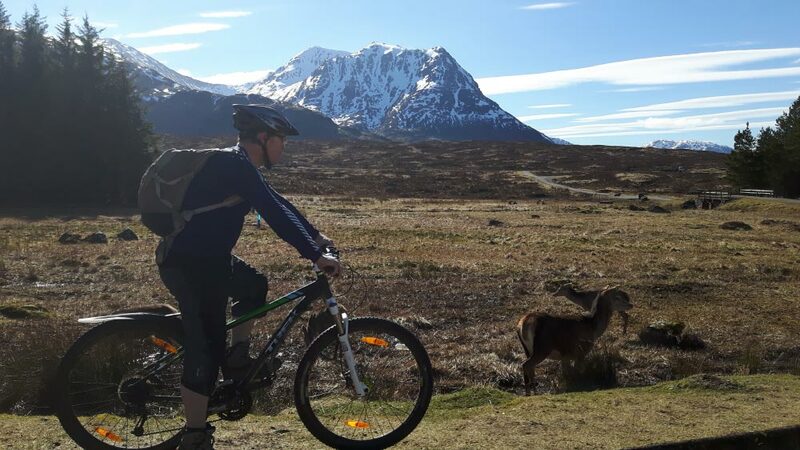 Whatever your mountain biking preference, Scotland is undoubtedly a world class destination for both purpose built and natural trails. On one of our holidays you’ll be introduced to some of the best natural trails in the country and we can arrange for you to visit a purpose built centre if desired. The closest is only eight miles away from our headquarters in Stirling. See Tours. Our self-guided cycling holidays allow you the freedom to explore at leisure taking as much time as needed to sample your surroundings. We provide detailed maps and route notes for you to follow as loosely or tightly as suits. Most days you’ll be presented with a choice of route. Stick to the easy trails or head into the hills on a mountain biking adventure. Your adventure, you decide. We pre-arrange everything for you. We book the accommodation, supply a high quality hybrid or mountain bike and manage the transfer of luggage between hotels. We even provide you with back up support if required. Self-guided holidays come in both single centre and point to point form. On a Vurie Adventures single centre cycling holiday you can expect a good choice of cycling trails available right on the doorstep plus a diverse selection of alternative activities to choose from. One of the main advantages of our single centre holidays is that you can take your time to properly settle in and explore the local area in much greater detail. You do as much or as little as you like. Single centre cycling holidays are particularly suited to those lacking the time required to undertake one of our longer tours. If you’ve only got two or three days you can still pack in loads of cycling or any other activity for that matter. Each of our destinations has something to offer trail riders, mountain bikers, road racers and even non cyclists. And the range of alternative activities include: high ropes course; climbing walls; white water rafting; canoeing; kayaking; swimming; wild swimming; canyoning; archery; hill walking; and windsurfing. For our resort centred holidays where possible we’ve chosen accommodation with on-site leisure facilities such as a spa, swimming pool and gym. Or we’ve selected the destination because it has leisure facilities available for public use. It’s nice to relax in a Jacuzzi or pool after a day’s physical exertion but also leisure facilities may be attractive to non-cyclists or simply a good alternative something to do. Another key requirement when choosing our single centre destinations is that they have a variety and choice of good restaurants. Half board accommodation is available but for those on bed and breakfast deals we have ensured there will be plenty of options for dining out of an evening. Check out our recommendations for each holiday destination. When you arrive at your destination you will receive our information pack including details of the areas cycling routes and other attractions. One of our representatives will provide you with your bike and go over any final checks to make sure everything is to your satisfaction. Please call to discuss. One of our most popular forms of cycling holiday is the point to point or hotel to hotel as some like to call it. Each morning following a hearty breakfast you depart from your accommodation and journey by bike to the next destination. Your luggage is transported separately so you aren’t burdened with carrying it. All you need carry is a small day pack for essentials like energy bars and water or maybe even a picnic lunch. And on some routes even this isn’t necessary as the distance between watering holes can be very short. When you arrive at your hotel or bed and breakfast the luggage plus a warm bath or shower will be waiting for you. Some of our tours are designed to incorporate two nights in each location. This allows more time to explore the immediate area in greater detail by bike or other means. Also there’s often the chance to participate in other activities like canoeing, hill walking, climbing and more. Or simply you can just relax – after all you’re on holiday. The beauty of point to point tours is that they’re constantly changing. The scenery transforms by the minute as you roll along; no two places are ever the same and on arrival at each new destination a fresh set of faces is there to greet you. We’ve designed our cycle tours so the route passes by rivers and lochs that pose an invitation for a bit of wild swimming. By May the water is normally comfortable enough for a dook but it’s usually at its warmest from June to September. We note the good places to take the plunge in our on tour information packs. Remember to pack the swimming gear. We provide an information pack that contains a detailed description of the cycling route plus maps. There’s also information regarding each of the destinations you visit; a brief guide to sites of interest such as castles, museums and exhibitions; plus other useful titbits including websites and telephone numbers for services you may wish to use during the tour. One of the features of our self-guided holidays is that we provide vehicular support where required. If – in the unlikely event – you encounter a mechanical problem with a bike during the ride and cannot resolve it, we will send out a support vehicle and the member of staff will either get the bike back on the road or deliver you to your destination. We will then ensure you have a road worthy bicycle ready for action the following day. See Tours.